It's fun making food that requires assembling, and I have a passion for appetizers. 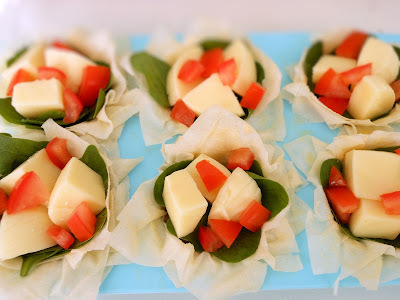 Therefore, making these small phyllo cheese cups was what I wanted today. I can't say that I love working with phyllo sheets. It can be frustrating sometimes as they are hard to handle. Nevertheless, I love the taste of these flaky, crisp dough sheets whether they are used for sweet or savory recipes. Today, I decided to make something savory with the phyllo dough sheets. 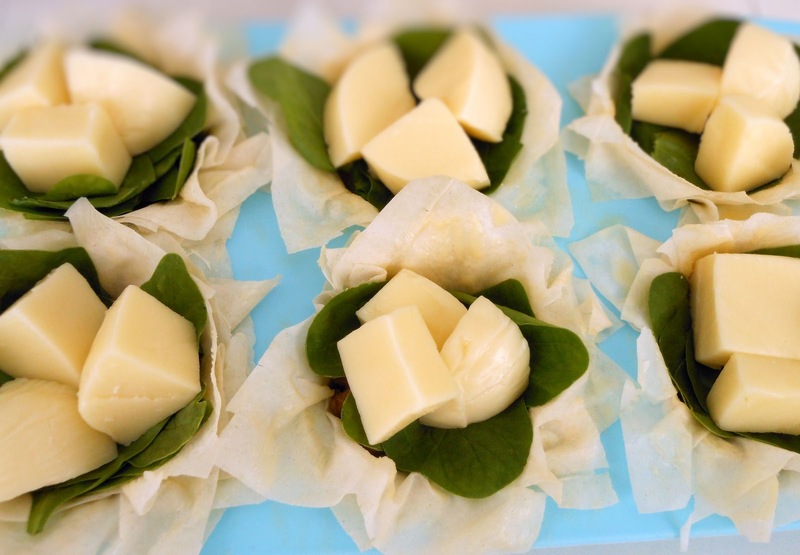 For making these phyllo cheese cups, I started with laying the sheets one by one, cutting them into squares, brushing them with butter, and arranging them nicely into the muffin cups. It was kind of nerve wracking the moment when I tried to take the cheese cups out of the pan after they were baked. The thin layers could easily get crumbled if I didn't handle them carefully. I made a total of six cups. They all looked beautiful. 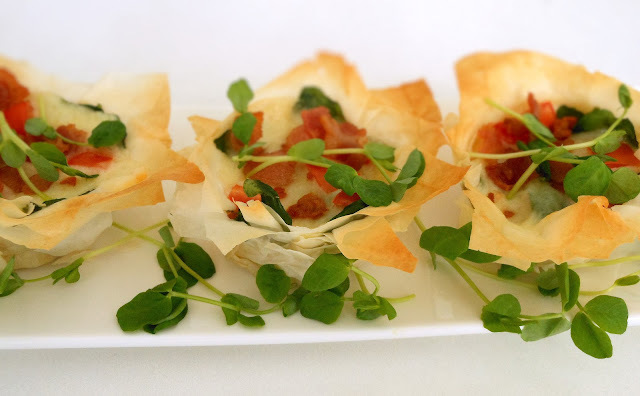 When I have guests coming over next time, these little delicate phyllo cheese cups will certainly be on the serving table. Cook the pork sausage in a pan until well done. Drain the fat. Set aside. Cut the bacon into dice. Cook and drain the fat. Set aside. Lay 5 layers of phyllo sheets on top of each other. Cut into 3 strips lengthwise, and 2 strips crosswise to make 6 squares each sheet. 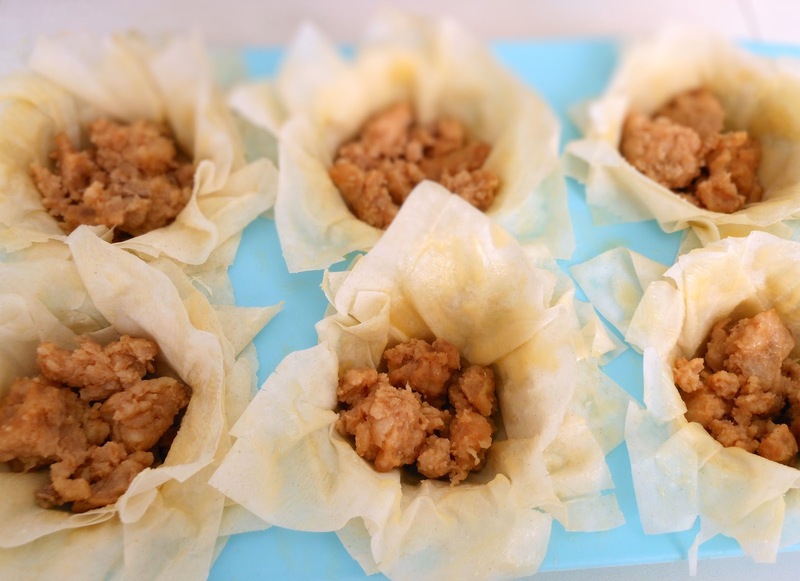 Brush each square layer with melted butter and press it into greased muffin cup. 5 layers for each cup. Arrange pork sausage, spinach, cheese and tomatoes in each cup. Bake for 15 minutes. 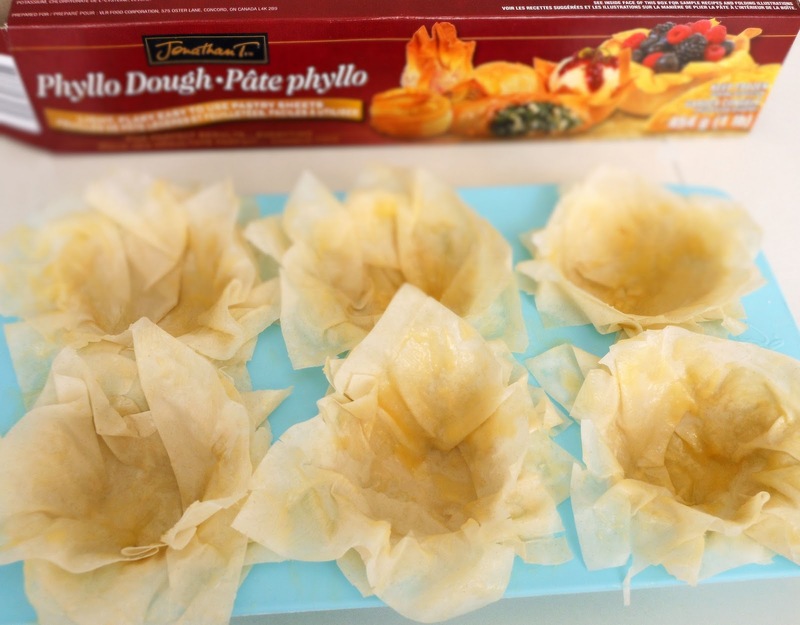 Remove the phyllo cheese cups from the pan carefully. Sprinkle some bacon over, and decorate with some sweet pea sprouts. Makes 6 phyllo cheese cups.